In a film culture dominated – visibly or not – by views inextricably tied to the concept of auteurism, there’s something irresistible about judging films by how they reflect the artistic evolution of their director. In the case of Paul Thomas Anderson, this arc is clear, moving from the wide-ranging ensembles of Boogie Nights and Magnolia to the intent historical studies of There Will Be Blood and The Master. 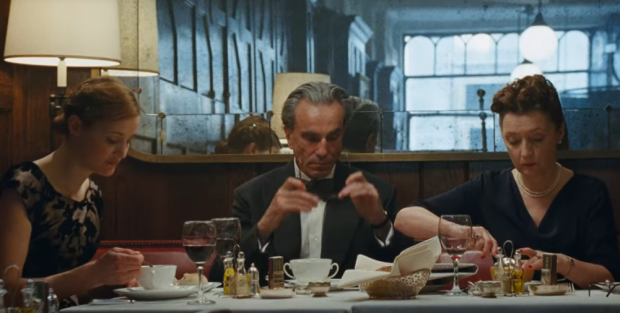 In particular, the latter two films and his latest effort, Phantom Thread, represent a neat trilogy (interrupted by Inherent Vice) of stylistic and thematic development. But at the same time, this film represents something daring in Anderson’s career: something astonishingly shapeshifting, tracing the ebbs and flow of a relationship with an exceeding amount of care, all with a lushness and richness of form that belies an essential, wondrous perversity. Anderson here works in a setting entirely new to him: the haute couture fashion scene of 1950s London, five thousand miles away from his preferred setting of Southern California. It centers upon Reynolds Woodcock (Daniel Day-Lewis), an intensely private and controlling acclaimed fashion designer with only his sister Cyril (Lesley Manville) as a constant companion. Things quickly change when Reynolds happens upon Alma (Vicky Krieps), a shy, quiet waitress who becomes his muse. To reveal much more would give away some of the most genuine surprises of 2017, but suffice it to say that their relationship is forced into changes that eventually put Alma on an equal footing with the two seemingly indomitable siblings. Anderson’s attention to detail and mood, especially in period settings, has always been uncannily attuned, and it feels even more heightened here. Much of the film is suffused by returning collaborator Jonny Greenwood’s score, which has a lilting, swooning quality, reminiscent of music far removed from the Hollywood of today, that matches perfectly with the gliding, elusiveness of the cinematography (headed by an uncredited Anderson). 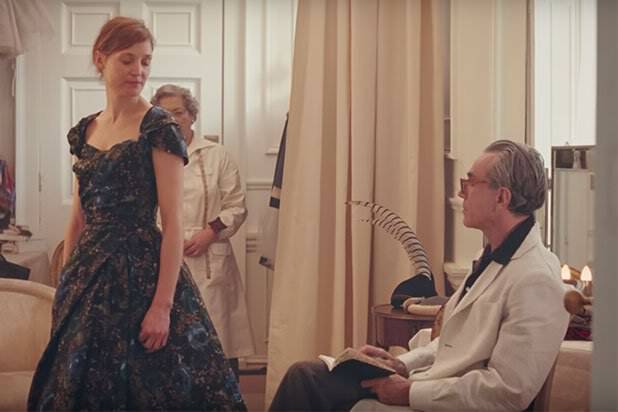 What moves and transports about Phantom Thread is precisely that which cannot be adequately described without foreknowledge of the film’s summed development. Such intensity towards something so ostensibly normal and gentle is rare, especially when combined with a certain sharp wit and humor. Constantly evolving before the viewer’s eyes, it works in both stillness (the gazes of Day-Lewis, Krieps, and Manville) and dynamism (the world that swirls around them) to create something that simply embodies romance.